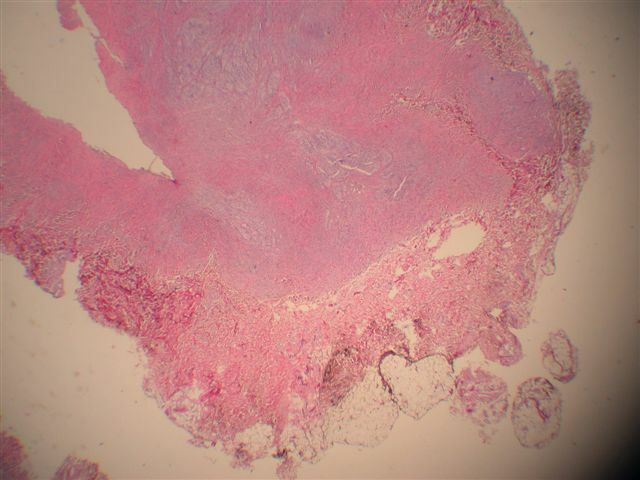 This is our seventh Case of the Week.� These cases can also be accessed by clicking on the Case of the Week button on the left hand side of our Home Page.� This email is only sent to those who requested to be on this list in writing or by email.� To view the images or references, you must click on the links in blue. 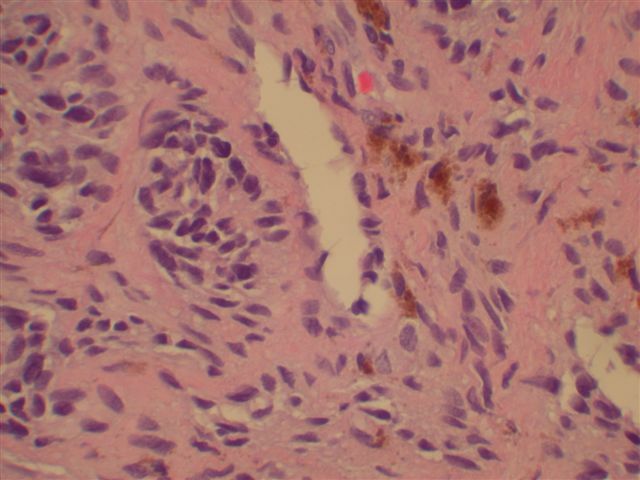 To subscribe or unsubscribe, email NPernick@PathologyOutlines.com, indicating subscribe or unsubscribe from Case of the Week.� As always, we do not sell, share or use your email address for any other purpose.� We also maintain an email list to receive a biweekly update of new jobs added to our Jobs page, and three separate lists for Pathologists, Residency Directors or Fellowship directors who want to receive quarterly updates about our website.� You must subscribe or unsubscribe separately to these email lists. 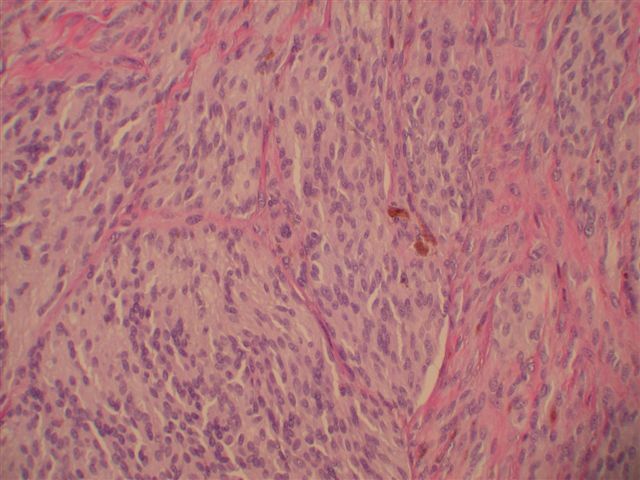 A 19 year old man had a few month history of a 0.5 cm subcutaneous, firm, grey lump on the right wrist. 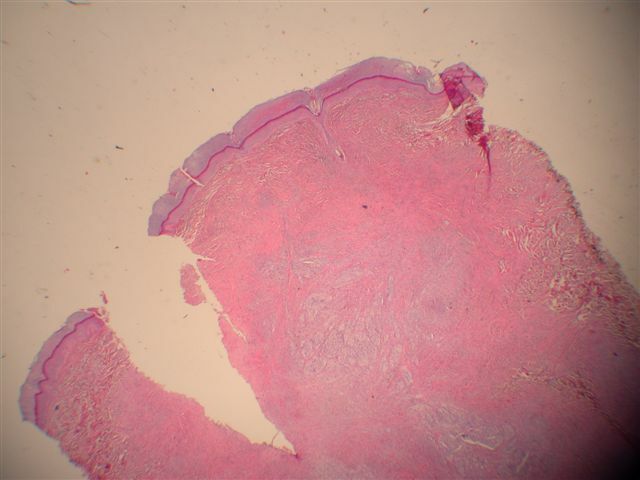 �It was clinically suspected to be an epidermal cyst. 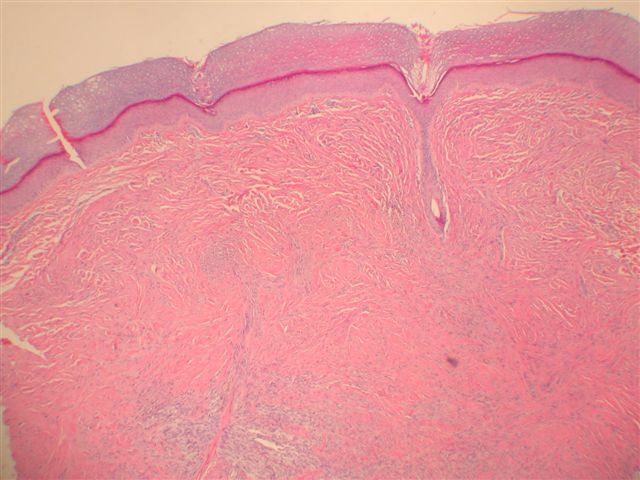 Blue nevi appear to arise from the arrested migration of immature melanocytes in the dermis. �They are uncommon, and are usually diagnosed in adults, but may become apparent in early childhood or even at birth.� Their blue color (clinically) is due to the Tyndall effect of selective absorption of parts of the light spectrum by deeply located (dermal) melanin pigment, which is usually abundant.� There are several types of blue nevi, including common, cellular, atypical cellular, epithelioid and malignant. 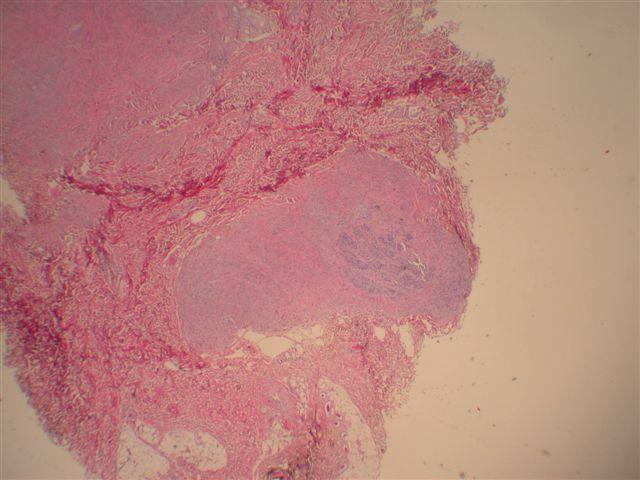 The cellular blue nevus most commonly involves the buttock and sacrococcygeal areas, but may also involve the scalp, face, hands and feet.� It is considered benign, but may rarely recur or involve regional lymph nodes.� Unfortunately, no specific features to date have been identified to indicate whether cellular blue nevi will have aggressive behavior. Cellular blue nevi are usually large (greater than 1.5 cm), with intense pigmentation.� Microscopically, they consist of a well circumscribed collection of interweaving fascicles with increased cellularity and infiltration into the subcutaneous tissue.� Heavily pigmented spindle and dendritic cells alternate with clear cells.� The cells have finely eosinophilic or clear cytoplasm, with vesicular nuclei and small nucleoli.� They may rarely be amelanotic.� The margins are usually pushing.� There is no/minimal atypia, no nuclear pleomorphism, no epidermal invasion, no peripheral inflammation, no necrosis and no/minimal mitotic figures.� However, scalp lesions may exhibit intracranial extension. 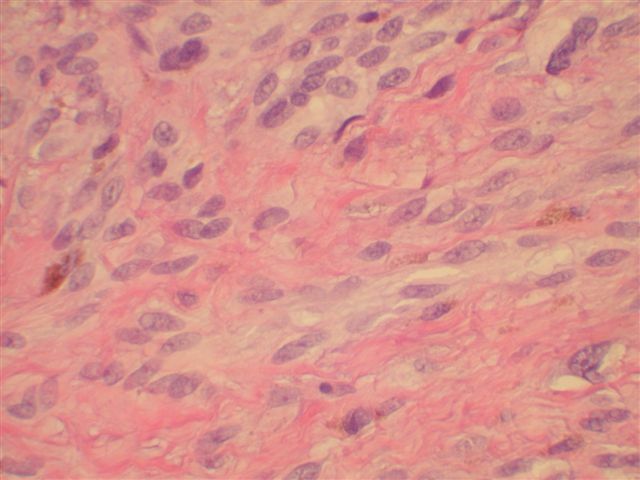 Cellular blue nevi, as well as common blue nevi, are immunoreactive for melanocytic stains, such as S100, HMB45 and MelanA/Mart1.� Treatment consists of simple excision. 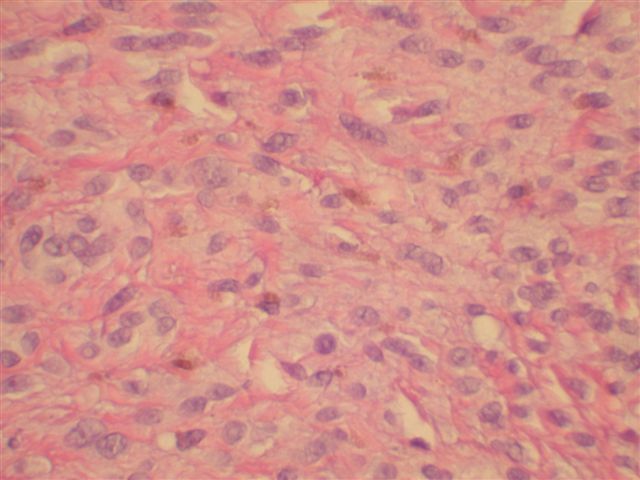 The differential diagnosis includes atypical cellular blue nevi, which exhibit either atypia insufficient for a diagnosis of malignancy or a mitotic rate of less than 2 per square millimeter.� They are also treated with conservative excision.� The differential diagnosis may also include malignant blue nevi, which are very rare melanomas that are highly aggressive and may metastasize and cause death.� They either have malignant cytology with a benign blue nevi component, or appear benign at low power but have infiltrative borders, necrosis, mitotic figures or atypia at higher power.